The Accounts Payable Log is a helpful tool that allows business owners to log and track any number of business accounts easily and on one document. The template file will also calculate the totals for each account as well. You can then track those accounts independent of one another. You will also receive a pie chart indicating the amount you have in the account versus the amount you owe. If you want to stop wasting time on calculations and start making your life much easier, download the free Accounts Payable Log today. The first step is to download the free document to your computer. To download the template, just click on the link provided for you at the bottom of this page. The next step is to go through and list out the accounts you want to track. The template has enough space to enter 4 different accounts. 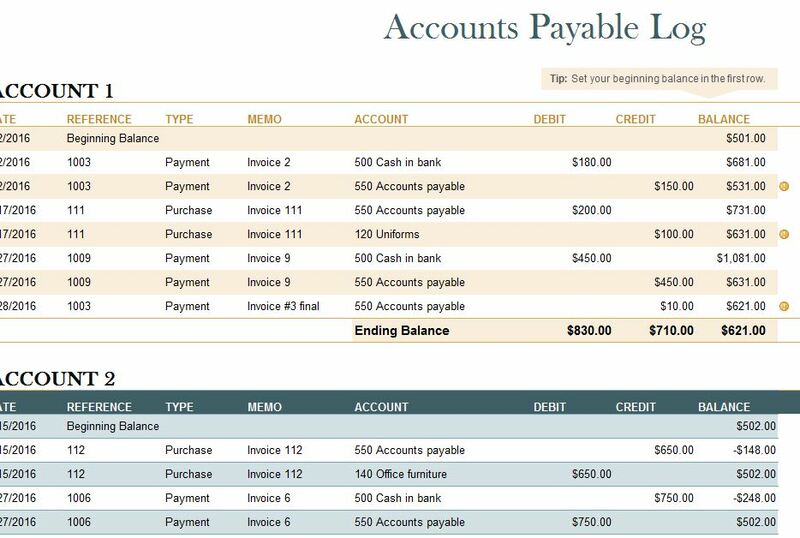 However, you can right-click on the tab and make more copies of the Accounts Payable template to store more account information. You can then proceed to name your accounts at the top of each table. To change or edit any of the examples just click inside the cell you need to change and write something new. Now you can follow along the header above, adding the corresponding information below. First, enter the date, reference, type, invoice #, bank account used, and the appropriate amounts. If you’re adding money to the account, enter that in the debit section. You will enter expenses in the credit column. The template will display your current total for that specific account at the bottom of the table. You can also see a pie chart, giving you the same information. When you’re ready for the next account, just repeat the process in the next table down. You can keep track of your accounts efficiently with this simple and free Accounts Payable template.